In the past few decades rapid economic growth in emerging Asia has led to a critical increase of greenhouse gas (GHG) emissions, especially in China, which has now become one of the biggest GHG emitting countries in the world. To decouple economic growth from negative environmental impact, renewable energy sources and associated new technologies have emerged. Transition to renewable energy sources, however, requires a massive investment from various financial sources. 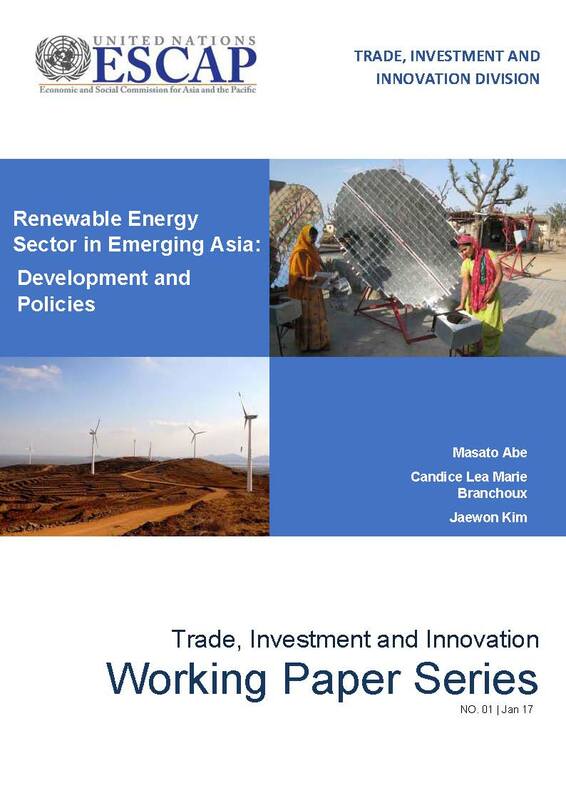 In this sense, this paper particularly focuses on greenfield foreign direct investment (FDI) as one of the most efficient and practical ways to enhance environmental sustainability through the development of the renewable energy sector beyond its obvious contribution to finance capital for sustainable development. FDI does not only enable the transfer of capital but also facilitates the transfer of technology and expertise to boost the use of renewable energy from multinational corporations (MNCs) to host countries of FDI and local companies. FDI also contributes to the host country’s economy through the creation of direct, indirect and inclusive jobs in the low-carbon and resource-efficient sectors, also known as “green jobs”. In the world, as well as in emerging Asia such as ASEAN member States, China and India, the creation of new jobs related to conventional energy sources, such as oil, natural gas and coal, has massively decreased since 2010 while green jobs have gradually increased over the same period, especially in the biomass, solar and wind sectors. Targeted policy interventions would promote and facilitate trade and investment in the renewable energy sector and the deployment of renewable energy and therefore foster job creation. The effectiveness of such policies is sensitive to good public governance, strong trade and investment facilitation and well-designed economic incentives. For example, the feed-in-tariff (FIT) scheme has been one of the most widely adopted subsidy-like policies to spur the uptake of indigenous renewable energy for the last two decades, and the relatively recent adoption of the scheme in five out of the 10 ASEAN member States, as well as in China and India, has contributed to the rapid development of solar and wind energy markets.